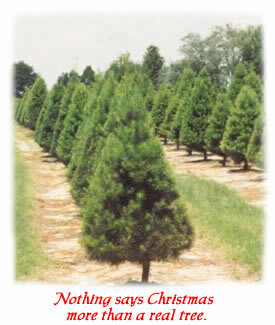 Nationally, about 30 million real trees are used for Christmas annually. They are grown on farms and plantations in Florida and in almost every other state and Canada. Christmas tree harvesting does not upset the ecology. More than 85 million trees were planted this spring by Christmas tree growers to replace the 30 million trees that will be harvested this year. The rule of thumb is to plant two to three trees for every tree cut. 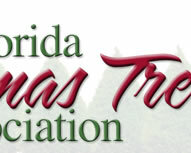 Purchasing a homegrown Florida tree is good for the environment because less fuel is used in transportation. This also supports the farmers of the state and boosts Florida's economy. A tree that is moist when brought into the home and is kept moist by adding water through the base of the trunk will not be a fire hazard. People still love the tradition of real, natural trees in their homes for the holidays. This tradition dates back to 1500 A.D. The first Christmas trees were decorated with roses cut from paper, apples, wafers, sugar candies and candles. Later, cookies in the shapes of angels, hearts, and animals replaced the wafers. Today's decorations vary with individual tastes. They include special ornaments, garlands and bright lights. 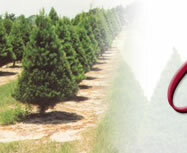 Natural Christmas trees are used everywhere in both home and commercial decoration. They are used in all types of indoor and outdoor displays. The White House has a number of natural Christmas trees. 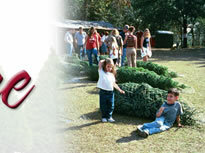 The whole family can have great fun in the process of choosing a tree. The preferred species of tree is often passed down from generation to generation. 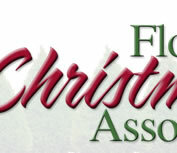 In Florida, Red Cedar, Virginia Pine, Sand Pine, Spruce Pine, Arizona Cypress and Leyland Cypress are grown specifically for use as Christmas trees.